The UK government has announced that the differential between fuel duty on diesel and alternative fuels has been extended to 2032, providing a major boost to an already surging natural gas industry. 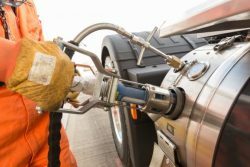 Natural Gas Vehicle Network (NGVN), which lobbied for the extension, says adoption by HGV operators will help address high emissions from this sector. Gasrec, a leading fuel supplier for natural gas-powered HGVs on UK roads, explains how the budget will support the decarbonisation of the UK transport sector: duty paid on fuels such as biomethane and natural gas will remain 50% lower than diesel for the next fourteen years. Government support for viable alternative fuel options for fleets is vital in underpinning the transition from diesel. The maintenance of this differential provides certainty for those considering adopting alternative fuels and underpins the business case for doing so. Price stability through a strong commitment from government enables decisions for the longer term to be made by both fleet operators and natural gas infrastructure providers. The commitment provided this week shows support for what is likely to be three phases of fleet renewal for operators. The commitment is significant in supporting the government’s Road to Zero strategy aim to reduce HGV greenhouse gas emissions by 15% by 2025. Natural gas delivers this saving and is the only commercially viable alternative fuel to do so, Gasrec states. The move also reflects a tightening of government policy on the use of diesel. Thus far, the government has begun to roll out Clean Air Zones across the UK, with five set to be operational by 2020, and has imposed further emission zones and charges, such as the T-Charge, which targets high-polluting diesel vehicles in central London. Natural gas is an emerging technology in the LGV/HGV sector and has seen rapid growth with the release of gas vehicles from major manufacturers such as Volvo, Scania and Iveco over the past year. Household names such as Ocado, Waitrose, UPS and Sainsbury’s have been quick in adopting the technology. 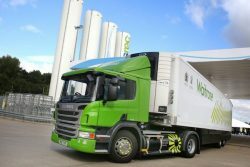 Recently John Lewis and Waitrose pledged to end their purchasing of diesel trucks in a bid to make their fleet diesel-free by 2030. Fuels such as biomethane and natural gas achieve carbon reductions against diesel varying from 15-90% lower emissions. The upper end of that scale can be achieved by using biomethane, a waste-derived gas. The fuels also have a lower air quality footprint, achieving 99% lower particulate emissions and around 70% lower nitrogen oxides emissions. Mike Foster, Chief Executive, NGVN said: “HGVs in the UK represent just 2% of vehicles on the road but contribute 17% of transport carbon emissions. This needs to change. Keeping gas prices lower than diesel is exactly the sort of encouragement fleet managers need to make that essential switch, from dirty diesel to cleaner gas. Gasrec Ltd is a member of NGVA Europe and associate member of NGV Global. Gasrec provides information about the benefits of using natural gas out the benefits here.